This self portrait I completed right before the art walk, but with the jumble chaos that is my life this summer I haven't been able to post it till now. I brought it with me to the art walk and I was surprised at peoples response to it. There were more than many people who wanted to see more of my figurative work, which is really encouraging because painting the figure is my favorite subject of choice. 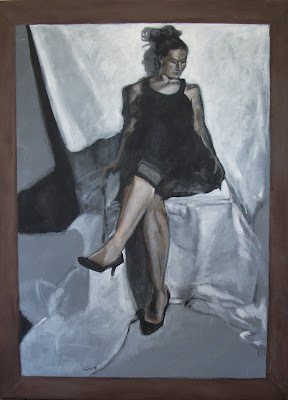 I hope that more of my figurative work will sell so that I can keep producing it. I have enough reference material to do a whole series like this painting, but having lots of reference material doesn't mean that I have lots of time.